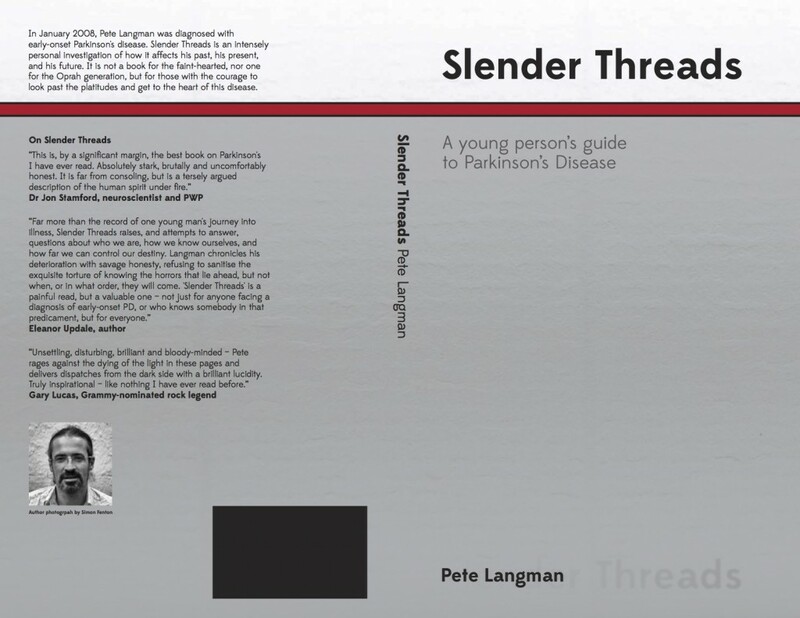 Slender Threads: a young person’s guide to Parkinson’s disease – my experience of receiving a diagnosis of Parkinson’s disease at the age of 40. Read reviews here. Eight years ago, on January 30th, my life changed. It changed because a consultant uttered the words ‘you have Parkinson’s’. In the months that followed, my marriage, my career, and my sense of self took an almighty battering. Just over a year ago, I started to write my story, because I had struggled – and continue to struggle – to make sense of my condition. I reckoned others might have the same problem, and I hoped that by sharing I might be able to help both them and myself. I had no trouble finding out technical stuff about Parkinson’s, this being the age of instant information, and at some points it felt as if I was finding out too much, too fast, especially during the process of diagnosis. But there was far less information on the way it makes you feel … especially when diagnosed at or before 40, what they term ‘early-onset’ Parkinson’s. Bloggers such as Zalamanda, Jon Stamford, Colleen Henderson-Heyward, Viktor Tron and others have gone a long way towards redressing this balance, but I wanted to take it a step further. The book pulls no punches. I try to talk to the reader the way I wanted people to talk to me, both during diagnosis and now. I didn’t want to hear people telling me how they knew I’d fight it, how I had to remain positive, how you couldn’t really tell, all that stuff. I wanted to confront the reality of the situation, so that I could find a way of dealing with it. It’s been difficult to write. Some people have, and will, find it equally difficult to read. When I hear that someone’s reading it, part of me leaps for joy that they think something I’ve written is worth reading, while another part of me cowers in the corner. Ultimately, I wrote it because I had to. Where to find it: On Amazon as e-book or c-book (that’s carboniferous). What Colleen said. Really good that you’re doing this. I must admit that I am overwhelmed by your honesty and generosity in sharing the minute details of your painful journey with PD. I hope I am not exaggerating to say that your cry in the face of the unexplained nature of PD has deeply touched my soul. At times, I felt really angry at the injustice of life. Thank you Pete for offering us a deep insight into what, no website, would be able to offer in terms of what a PWP feels, fears, expects and needs from others. Thank you for being a source of inspiration in many different ways. As I am reading about your genuine revelations in 2018, that is six years since you first has written your book, I hope that the pessimism of 2012 has given way to a more optimistic attitude especially with regard to a stronger faith in love. Interesting assumption that a diagnosis will be correct. This is not always the case…. certainly, PD or YOPD is still only a vague idea of what lies in store… it can be levodopa responsive, or non-responsive; it can be tremor dominant, or have other leading symptoms; you are not immune to other disorders, some of which will kill you before the PD takes over e.g. cancer. Goodness. Your empathy astounds. As does your fundamental misunderstanding of what I’m writing about. Thank you for writing Slender Threads. It is a beautifully written account of an ugly disease (I was diagnosed last year at age 33). One of the major themes I think is your attempt to understand the prognosis; as you say, those three words, chronic, incurable, progressive. I’ve been trying to resist thinking of the future because Parki’s is too unpredictable and the future simply doesn’t exist yet. We only have the chance to react in the present to what is happening now (as you know, cricket is played one ball at a time). Just after diagnosis I nearly drove myself nuts thinking of all the might-be’s. I was missing the chance to manage my symptoms now. Anyway, your book has helped me understand and I thank you for that! 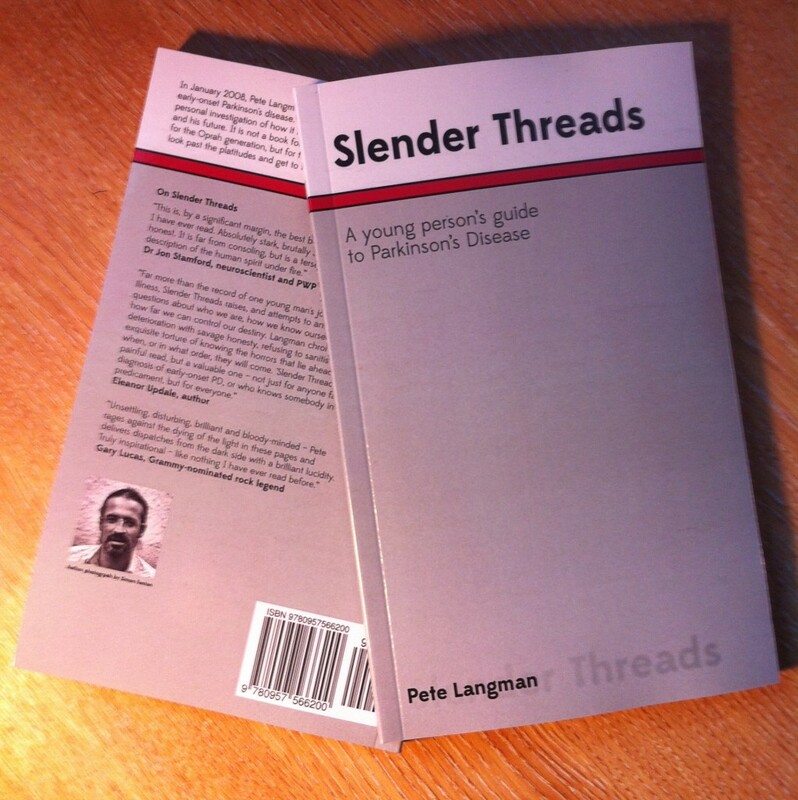 All I can say in response to that message is that if you were the only person who had read Slender Threads, it would have been worth it. Thank you.